History was made on 7 July when nuclear weapons were banned under international law. 122 governments adopted a new treaty at the United Nations making the possession of these horrific weapons of mass destruction illegal, along with other related activities such as testing, using, developing, or assisting with nuclear weapons (which includes financing or planning to use the weapons, among other things). The treaty also includes provisions for assisting victims of nuclear weapons use and testing, and environmental remediation. It is the first treaty to recognise the disproportionate impact of nuclear weapons on indigenous people and on women. WILPF is a vociferous supporter of nuclear abolition, and has been an advocate of the ban since the idea was first conceptualised. Through our role as a steering group member of the International Campaign to Abolish Nuclear Weapons (ICAN), we have mobilised across the globe through advocacy, developing policy briefs and conducting research, monitoring discussions and negotiations, and speaking out on media and social media. 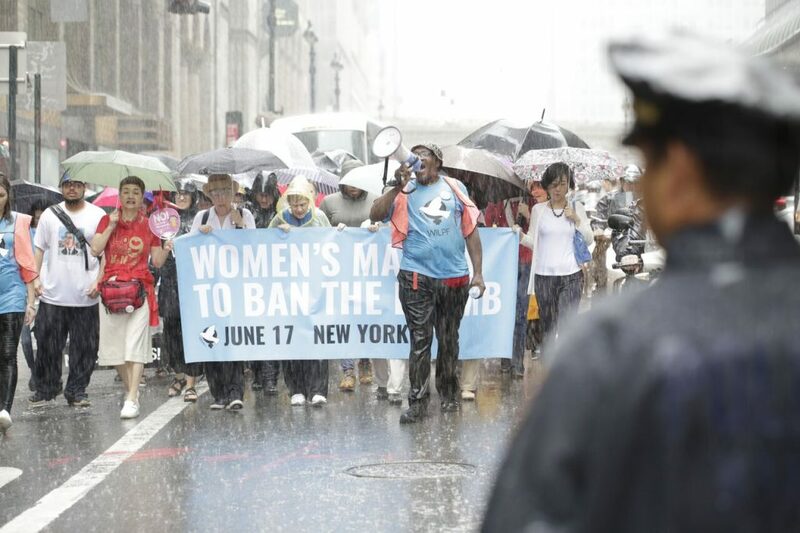 WILPF was the official host of the Women’s March to Ban the Bomb, a global public mobilisation event that took place on 17 June as treaty negotiations resumed at the United Nations. We worked closely with women representing peace, disarmament, women’s rights, indigenous, environmental, and human rights communities to coordinate this epic event. While the primary march and rally took place in New York City, there were about 150 diverse solidarity actions all over the world! WILPF Ghana organised a solidarity event in Accra that included a peace walk and community engagement event. 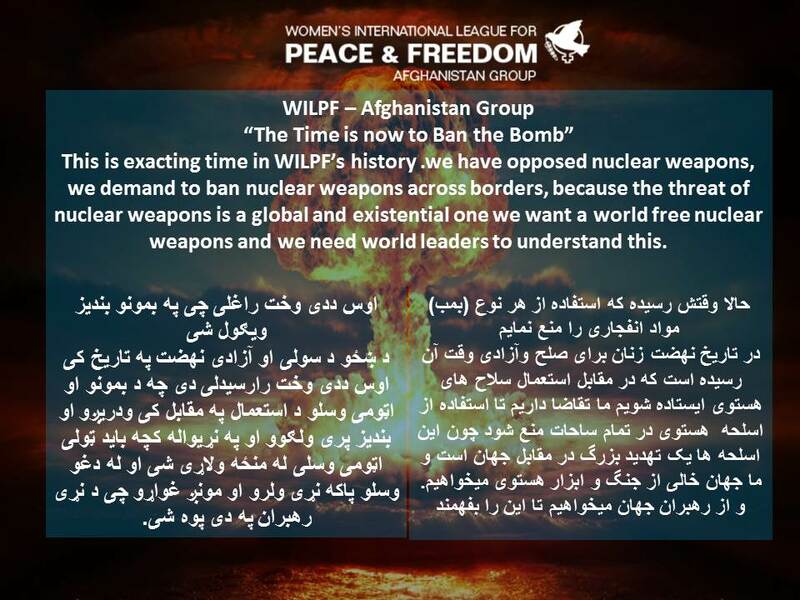 WILPF group in Afghanistan created a postcard featuring a strong call to action for a nuclear weapons ban. 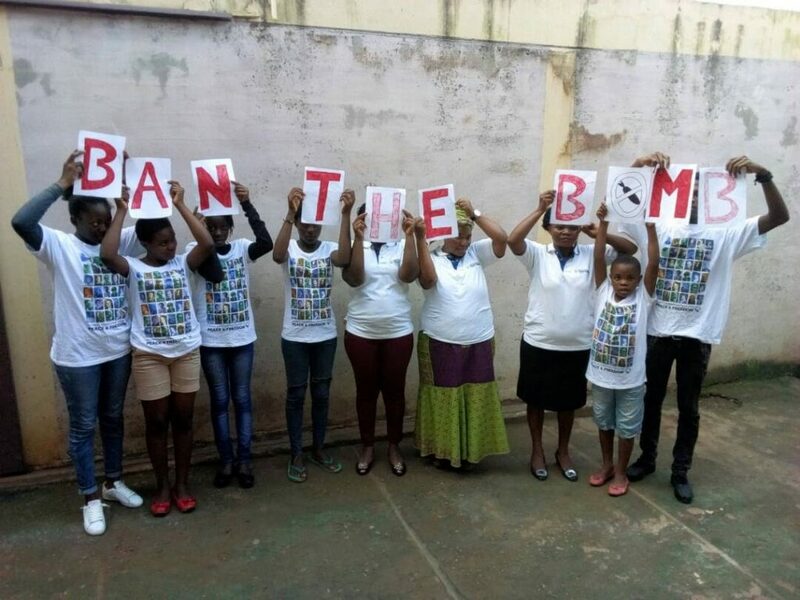 Solidarity walks were organised in three regions of Cameroon that generated photos showing a diversity of people standing up for the ban. There were approximately 20 solidarity actions across the United States, some of which – such as in San Jose, Milwaukee and St Louis – were hosted by WILPF. 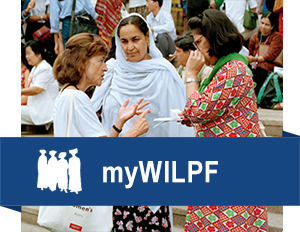 Women from the WILPF US played a central role with overall coordination of the event, including New York, and either hosted or supported many of the nearly 20 solidarity actions that took place across the country. 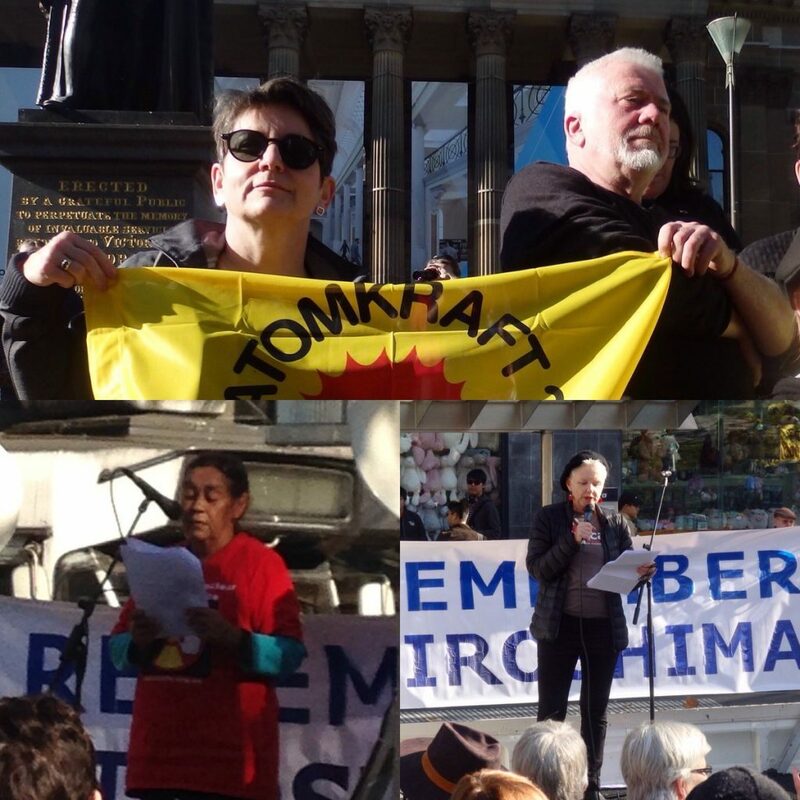 WILPF Australia collaborated with ICAN partners on a national day of action that saw solidarity events take place in eight cities. This included marches in Brisbane, Sydney, and Adelaide; a rally in Canberra and a vigil in Hobart. More events took place in Darwin and Perth, and the largest was in Melbourne. In Scotland, there were a total of five events organised by WILPF Scottish Branch and Scottish Campaign for Nuclear Disarmament. Bairns not Bombs by WILPF and the Scottish Campaign for Nuclear Disarmament. At the New York event, around 1,000 committed people came out to march despite heavy rain and wind. The march was followed by a rally outside of the UN where an inspiring line-up of women addressed the determined crowd. Among them was Kozue Akibayashi, the President of WILPF International, who along with fellow speaker Aiyoung Choi has crossed the Korean demilitarised zone in the name of peace. “The sufferings of Hiroshima and Nagasaki have continued through generations. It is time for the governments to listen to the voices of women calling for elimination of nuclear weapons,” stated Kozue Akibayashi. More activities took place in Bolivia, Canada, Belgium, Denmark, Germany, Italy, Japan, Lebanon, New Zealand, Norway, the Philippines, Spain, Thailand, and across the UK that included meet-ups, marches, seminars, and photo actions. Of course, WILPF’s participation in the negotiations also extended into the UN meeting rooms. Our disarmament programme, Reaching Critical Will, provided daily monitoring and analysis of the talks through its publication, the Nuclear Ban Daily. We delivered two statements to the conference during the sessions that were allocated to civil society; and provided the overall coordination for these sessions, which required liaising with dozens of organisations throughout the meeting. We helped facilitate speaking slots for nuclear weapon survivors, parliamentarians, activists, and academics from around the world. Reaching Critical Will’s programme director, Ray Acheson, moderated a side event that looked at the effect of nuclear weapons use and testing on women. 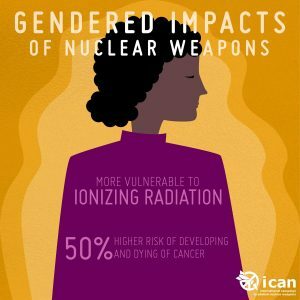 This is an important aspect of nuclear violence that is often overlooked, but is now referenced in the preamble of the new treaty, along with reference to the importance of women’s participation in disarmament. The inclusion of these points in the final version of the treaty is significant and was one focal point of our advocacy, as we saw the related language strengthened over the course of the negotiations. We were also deeply involved in advocacy with governments in the years leading up to the development of this treaty and during the negotiations. We wrote some of the seminal briefing papers on this treaty and provided expert analysis throughout the proceedings, helping wherever possible to shape the treaty’s language and approach to certain issues. We pushed for a strong, comprehensive treaty to make a difference in the world. The Scottish team of six in New York for the Women’s March and the negotiations included four WILPF members, who also co-hosted a side event presented the Scottish view on the ban and nuclear weapons more broadly. Amy Christison witnessed the way that civil society and diplomats worked hard together and how their knowledge, awareness and subsequently passion for change, grew substantially, proving the value of the civil society input and push for a strong treaty. Dagmar Topf Aguiar de Mederios found it heart-warming to see so many people joining forces for the cause, noting that even terrible weather on the March only added to peoples’ spirits and determination. Isobelle Smith, a 14 year old in Scotland at the time of Hiroshima, and forever affected, said that to be at the United Nations 72 years later for the successful outcome was truly wonderful. Gabriella Irsten from WILPF Sweden attended the negotiations, and brought her experience and expertise on disarmament issues to advocate with many participating governments, including Sweden, which was one of the few European governments present. 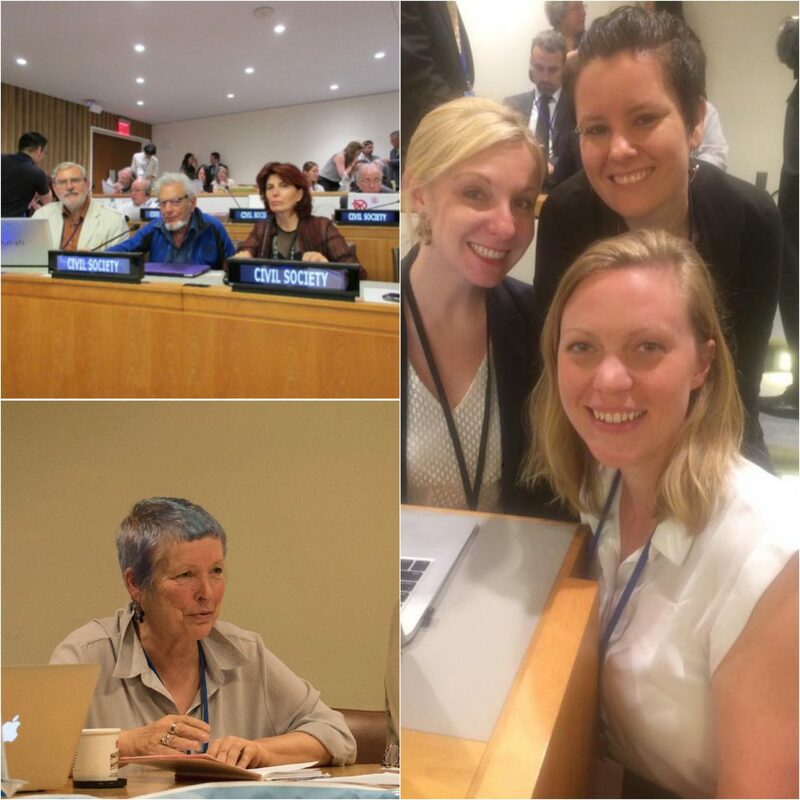 Two members from WILPF Italy were also attending the negotiations in New York representing a vocal civil society movement that in Italy is putting pressure on the Government to participate constructively in the nuclear disarmament process (Italy didn’t participate in the negotiation of the treaty). “The negotiations that led to the adoption of the Treaty gave me the proof of the rightness of what Emily Balch (the first WILPF International Secretary and Nobel Peace Prize in 1946) said at WILPF’s Founding Congress in The Hague: ‘Determination is power’. And we have exercised this power and will continue to exercise it” said Giovanna Pagani. “Our advocacy in Italy will now be very intense and it will aim at breaking the wall of the media and the political silence on nuclear issues”. The new treaty is a normative one that is strongly rooted in concern about the humanitarian and environmental impact of nuclear weapons. It was adopted by vote with 122 countries voting in favour and only one – the Netherlands – against. It will open for signature on 20 September 2017 in New York during the high-level opening of the UN General Assembly. Fifty countries must ratify it for the treaty to enter into force. Learn more about the treaty by reading this guide. We must keep up the pressure! The support expressed for the treaty over the last several years continues into this new phase where we will need to work even more closely with states and legislators to join and implement it, including the nuclear-armed states that have so far boycotted this process. Click here to see how your country voted. If it voted yes, encourage your government to sign the treaty at a high level when it opens for signature in September. Engage with parliamentarians to support the ratification phase that follows signature. If your country did not participate in the talks, or voted against its adoption, keep up the dialogue by pointing to the important impact that this agreement will make. Keep up the writing, tweeting, and other social media pressure! Follow @RCW_ and #nuclearban.